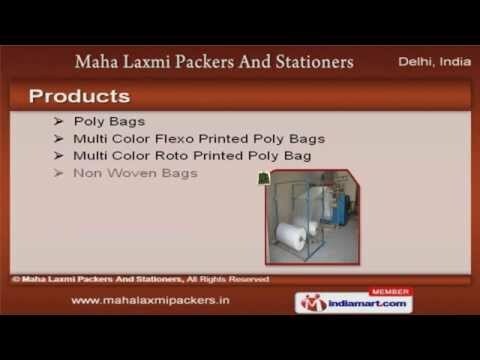 Welcome to Maha Laxmi Packers & StationersManufacturer & Exporter of Packaging Materials The Company was established in the year 2006. Experienced R&D department &excellent logistic support make us stand apart from also-rans. Large product line, customized solutions & Large production capacity help us to achievean enviable position in the industry. Our product list covers Poly, Printed Non Woven & Multi Color Flexo Printed Poly Bags. We offer Packaging Pouches & Promotional Banners that are available at affordableprices. Visiting Cards, Digital & Offset Printings offered by us are widely appreciated in themarket. Our Advertisement Items & Packaging Materials are a class apart. We also provide Garbage, BOPP & PVC Bags that are in huge demand across theglobal markets. Along with that we offer Non Woven Labels, Caps & Bibs that are cost effective.